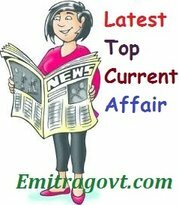 Current Affairs Question 2017: Looking for 29th July Current Affairs? Then start your Quiz right now by answering them. Here in this article, we are giving the Current Affairs Quiz with Questions and Answers. As many people are preparing for various government exams it became mandatory for them to get a grip over the current affairs as in most of the tests are based on Daily Current Affairs. By taking this kind of Current Affairs Quiz candidates can eventually get hold of what they have been working on. Contenders can trust us as we will update all the latest Current Affairs in this quiz. For more such quizzes check our site Emitragovt.com regularly as we will update the Daily Quiz for current affairs. 1. Leading global technology giant Microsoft has officially launched ‘Kaizala’, a productivity app that has been designed to enhance the collaboration and communication experience for Indian enterprises. 2. Former chief minister of Karnataka N. Dharam Singh passed away. He was 80. 3. Prime Minister Narendra Modi inaugurated a memorial dedicated to former president APJ Abdul Kalam at Peikarumbu near Rameswaram on his second death anniversary. 4. Narendra Modi has given approval for revision of guidelines of Sovereign Gold Bonds (SGB) Scheme. 5. Arundhati Roy’s new book ‘The Ministry of Utmost happiness’ has made it to the Man Booker Prize list for this year. 6. Nitish Kumar became the Chief Minister of Bihar for the sixth time and Sushil Modi took oath as the Deputy Chief Minister of Bihar. 7. India’s third largest private sector bank, Axis Bank acquired Snapdeal-owned recharge app ‘FreeCharge’ for $60 million. 8. State-owned Punjab National Bank (PNB) and Bajaj Allianz General Insurance have signed an agreement for the distribution of insurance products through the branches. 9. The government has appointed Economic Affairs Secretary S C Garg as Alternate Governor on the Board of Governors of Asian Development Bank (ADB). 10. Private airline, GoAir has appointed Anand Sahai as its chief commercial officer (CCO).